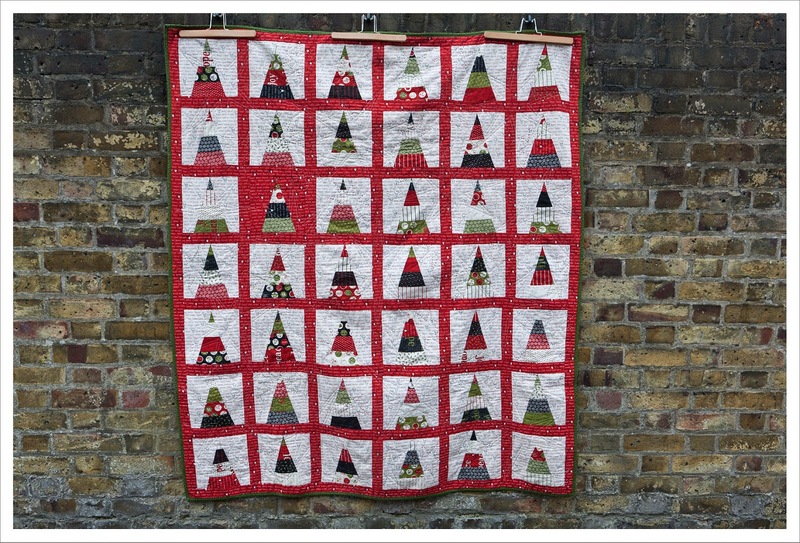 Well the official countdown to Christmas started in earnest last week but my 'Countdown to x-mas' quilt is already (or finally) finished. First things first; as promised I created a template for the blocks and if you wish to use it you can download it from here. I squared the blocks down to 8 inches. In my last post about this quilt I asked for advice on how to quilt it and got a lot of very good suggestions from you (thank you). For a while I was very partial to Laura's suggestion to use a cross-hatch pattern. I also liked Fiona's suggestion of loopy stars that Katy's trusted longarmer Chris used on Katy's constellation quilt but dismissed it as I didn't want to use a longarmer. 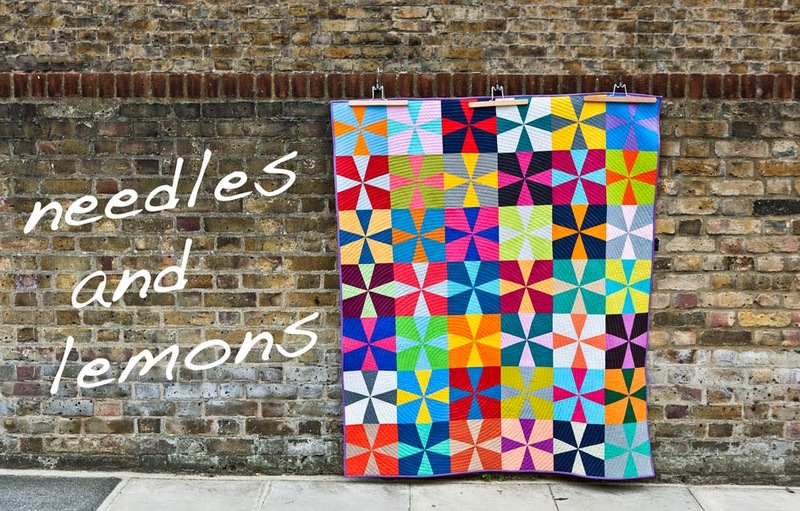 After some more pondering I had this revelation a few weeks back while running that I would make a Christmas Star pattern starting in the middle and then gradually increasing its dimension towards the outside of the quilt. I chose a star that was suitable for the rectangle shape of the quilt. I made a template from carton and drew with an hera marker the first star in the middle and then machine stitched along the outline with a double line. My plan was to then slowly increase the star using the guide on the machine. But that didn't work as the star I chose, albeit really beautiful, wasn't easily expandable without making new templates. 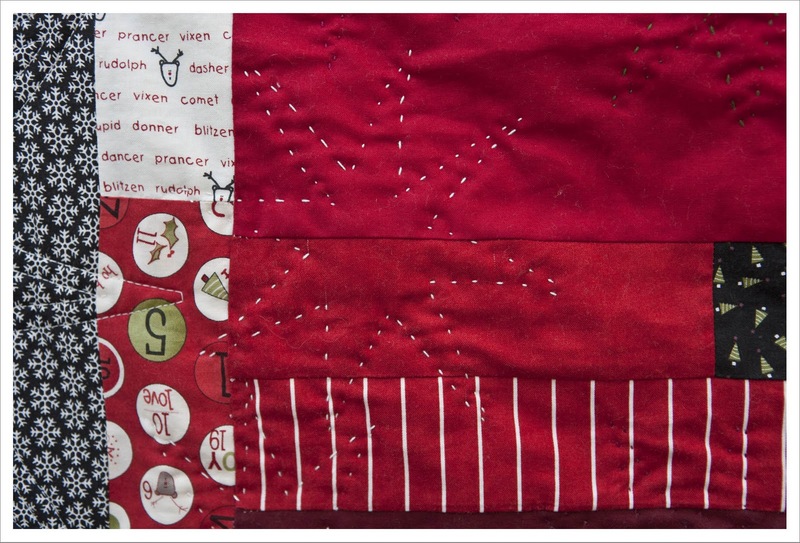 So I changed my plan rather to undo the quilting and machine stitched many stars which in effect brings me close to the quilting of the Constellation Star quilt after all ! When I had covered the quilt sufficiently with machine stitched large stars I moved on to hand quilting smaller stars. 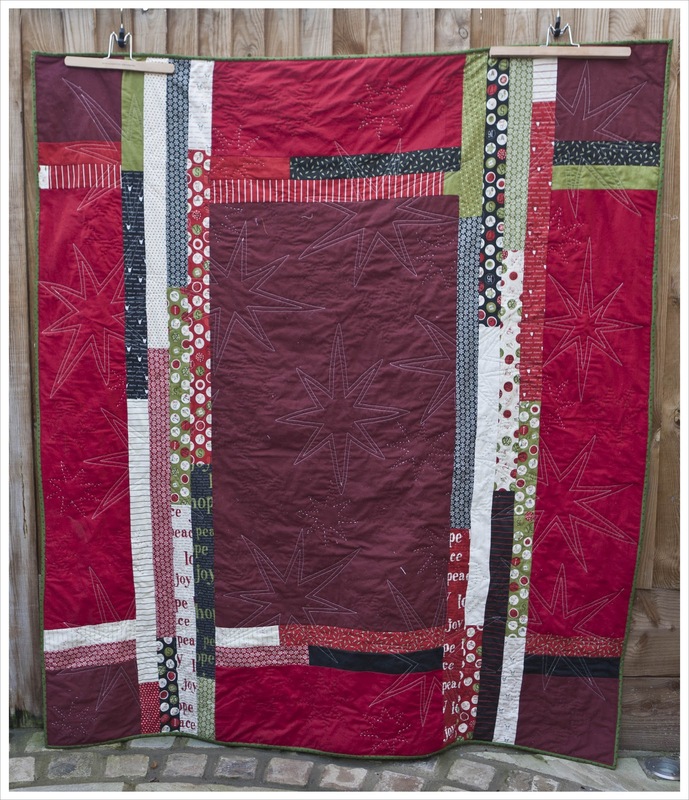 I used three different colours for hand quilting, a cream, dark red and dark green that are all in the same tones as the fabric but increase the contrast on the front of the quilt a little bit more. The machine stitched stars are all held in cream. I am happy with the outcome and in particular because I really enjoyed hand quilting again but I must admit that I am disappointed that my original plan didn't work out and therefore this isn't a quilt I am madly in love with (sorry my dear quilt..) but maybe this is one where love will grow over time. What I am very satisfied with is the way I made good use of almost all of the jelly role strips by incorporating them in the back. All solids used on the back are also from my stash of red fabrics I built originally up for the Very Berry quilt. It is a good feeling to be able to just pull fabric from stash (and to see said stash reducing somewhat !). I am really pleased with my choice of binding as it frames both the top and the back nicely. The binding is a dark green cotton with red dots which I believe is from the same collection but I am not sure (stats below). 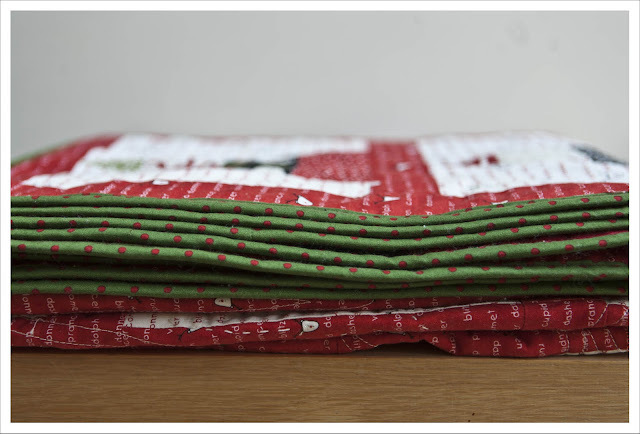 Fabric used for the front: One Jelly role of Countdown to x-mas from Sweetwater and several yards of background and sashing fabric of the same collection bought at Delray Fabric and Hulu Crafts. I do think it looks fantastic! Love the star quilting! Job brillliantly well done! 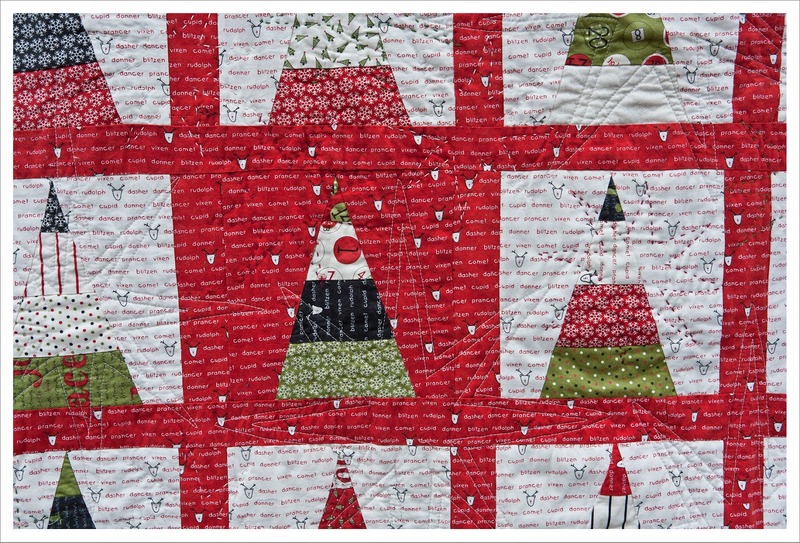 The star quilting is just perfect! What an absolutely beautiful quilt! looks fab Judith, I love the single solitary red backgroumd one! Great quilt! I really like how the quilting turned out even if its not quite how you planned! 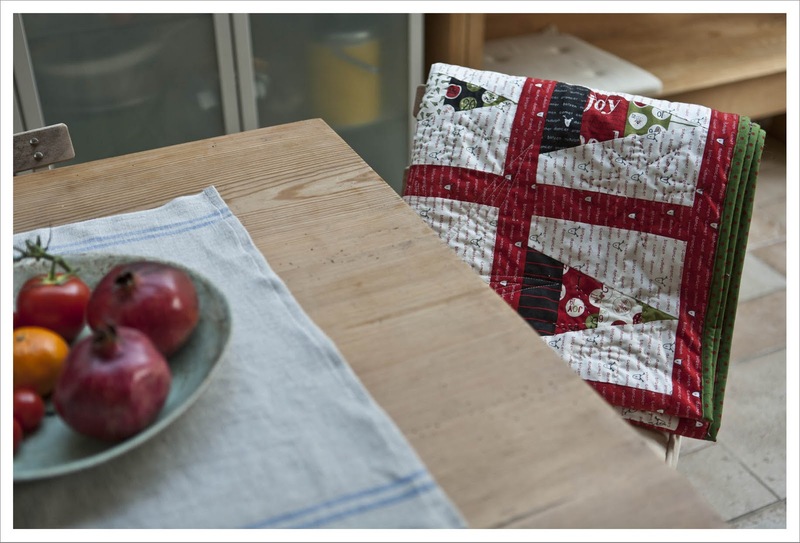 I think it is wonderful and I love all those stars you quilted into it! 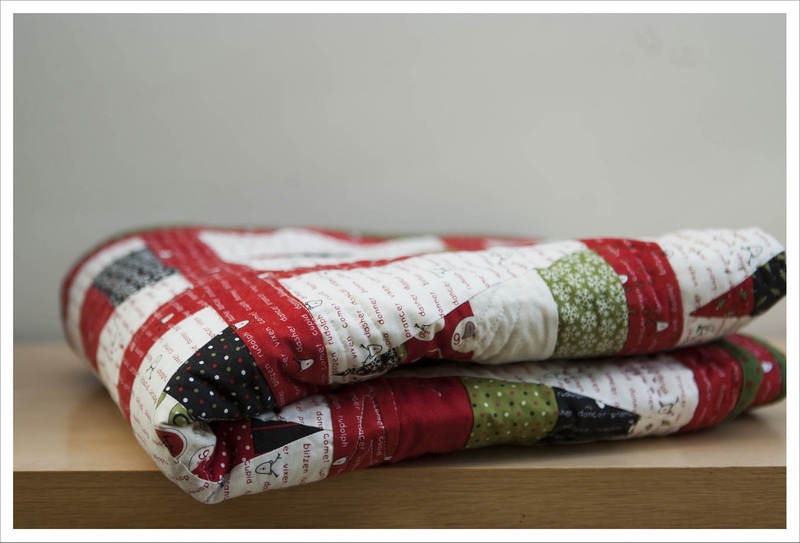 I love this quilt and would like to make one similar. Can you tell me about how much of the background fabric I will need of each (the red and cream)? I want to make sure I get enough. Thanks so much for posting the tree template! I tried to answer you via mail but unfortunately your profile only shows "no-reply-blogger". I can't remember exactly how much of the white and red I ordered but I think you will need more than a yard of white, possibly 1 1/2. If you chose to use a directional print like I did then you have a lot of offcuts. With a non directional print you get a way with less. The same holds for the red, though I think 1 yard should be plenty here. It depends how wide you cut your sashing strips.